With Easter and a fair bit of stuff going on at work, I've struggled to get reviews out lately. It's been over a month since I had to resort to an Untappd Catchup but everything has caught up with me now - so here we go. Level 3 of The Rising Sun badge was mine when I sampled the Hitachino Nest White Ale. I was really surprised that this was my first Untappd check in of this beer as I used to have it quite regularly. It's a witbier which has alot of coriander in the aroma and taste, it's very refreshing. Drinking Like a Kiwi (level 6) was achieved by sharing a cider with Lizzie. 8 Wired, one of my favourite New Zealand breweries, have recently produced their Dry Oaked Cider. I'm not a cider lover but this was really good, you could really taste the oakiness in combination with the apple flavour, it's definitely one I'd try again. Hello My Name is Vladimir (full review here) earned me the Brew Traveller (level 6) badge. This badge clearly has issues as I've said before - the check in that unlocked this badge was while I was walking the dog in the park behind my house, clearly not another state... Sticking with the location theme, level 5 in the Crisp as Day badge was unlocked away from home - at the Mornington Brewery to be precise. The new and improved Czech Pilsner from those guys is excellent. Finally I have knocked off New Brew Thursday! 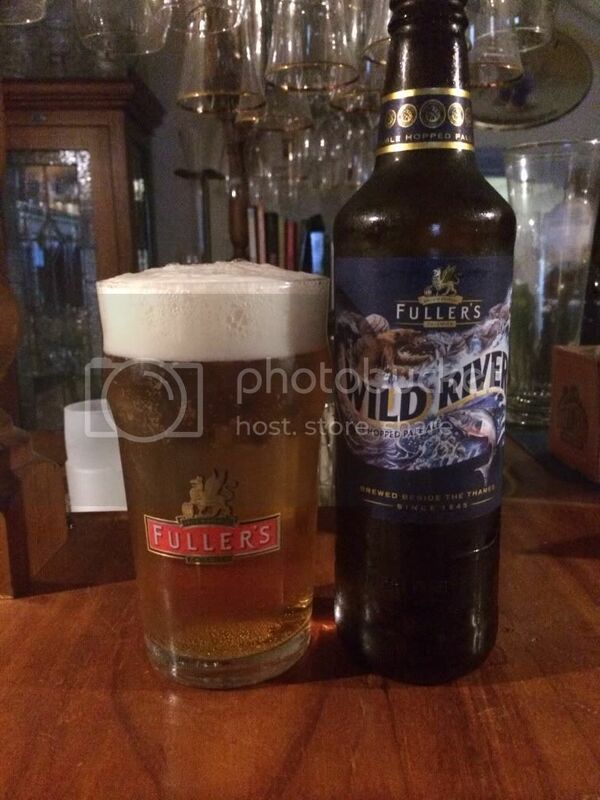 The beer that unlocked level 10 of the most confusing badge of Untappd was Fuller's Wild River. The beer itself was quite enjoyable although a little bland. At times it seemed like there was no bitterness and at other times it seemed overly bitter. There are much better examples of the style out there, although worth having one for the label. For the last little while I've been considering taking the plunge and becoming an Untappd Supporter. That day finally came on Saturday and to celebrate I cracked open a bottle of Lost Abbey Saint's Devotion. The marked ABV (probably not the actual ABV) is 6.66%, it's a Belgian Pale Ale brewed with Brett. Although it wasn't hugely sour, it was an enjoyable beer with the Brett providing more flavour than sourness. There were some pretty momentous badges in this catchup. New Brew Thursday has finally been completed and I am an Untappd Supporter for the next year. Apologies for the lack of reviews lately, but hopefully now that Easter is over I'll get back on top of things. If the planets align correctly, hopefully I will have an Easter review up some time this afternoon.